New Year's Eve is a time to celebrate hope of a brighter life. I'm beginning the year by trying a shiny new brand of nail strips! 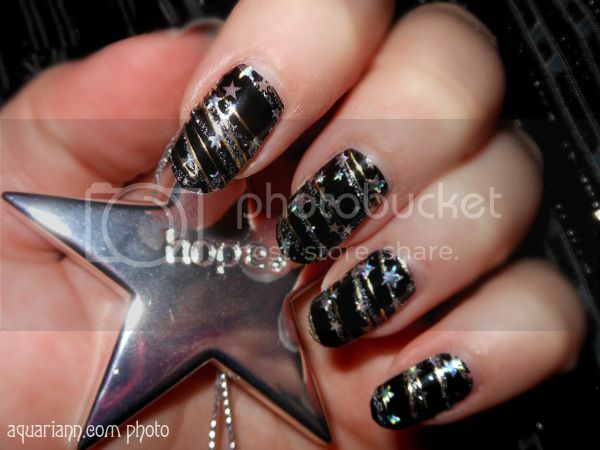 My mom bought me a starry design by Kiss: Nail Dress, Ultimate Nail Fashion for Christmas. The package came with a nail file and 40 nail strips. Half are cut for French Tips, so you'll be seeing similar shooting star nail art from me in the future. The strips were super easy to apply - all I had to do was pick a sticker that fit the nail the best, smooth it away from center and trim the excess away. According to the box, they last up to a week. I've only had them on a few hours and wonder how wearing Kiss' nail strips will compare to the others I've tried, Jamberry Nails shields, L'Oreal Paris Colour Riche Nail Lingerie stickers and Sally Hansen Salon Effects nail strips. Want to be a guest blogger for my Manicure Monday when I don't have new nails of my own to show off? Please contact me using the form on my contact page if you're interested in a free feature. Or if you've done a New Year's Eve manicure in the past, comment with the link and I'll add it to my featured finds below. That is beautiful and looks perfect for the new year. Love the stars! 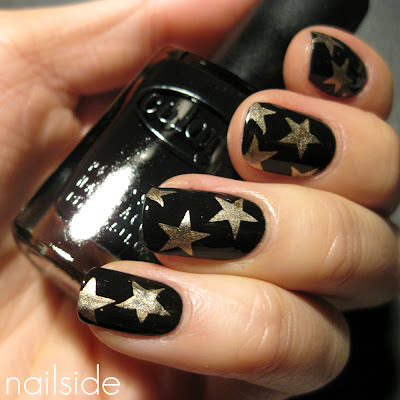 They really are the perfect New Years Eve nails! I love the starry design in silver and black. Perfect for New Year's Eve. Gorgeous design! Absolutely love it! You nails looks so pretty. Glad you liked them!!!! Gorgeous nails Kristin! They look gorgeous and I love the marble-like effect.